Google Data Studio turns your data into informative visualization and reports that are easy to read, easy to share, and fully customizable. Create as many as Data Studio custom reports with full editing and sharing. Do you spend hours and hours exporting, editing, filtering, and formatting your data? Are you tired of reconfiguring your Google Analytics data into neat reports and dashboards? Do you wish you could spend minimal time building reports and more time analyzing data? If your answer is “yes” to any of the questions above, then Google Data Studio is for you! Why use Google Data Studio? Data Studio gives you a blank canvas on which you can create a dashboards or multi-page reports. There are no fixed column sizes or widget areas. You can drag and drop items wherever on the canvas. The style and formatting options allow you to match your organization’s branding and colors. This makes it easier to create good looking dashboards for stakeholders. One major limitation of visualizing data within Google Analytics is that there is no way to combine data from other profile views or properties in the same template. In Google Data Studio, you can set the data source individually for each and every chart. 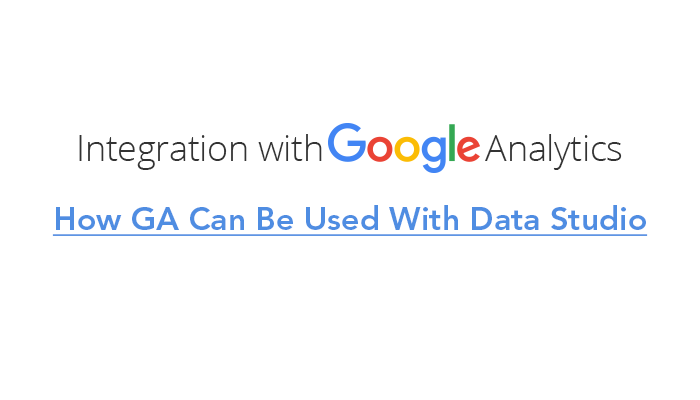 Data Studio has a variety of data connectors in addition to Google Analytics. You can bring in data directly from other sources such as AdWords, BigQuery, YouTube, or DoubleClick Campaign Manager. You can also connect to databases like MySQL or Cloud SQL You can even use the Google Sheets connector to access any data that can be uploaded as a CSV or spreadsheet file, such as social media or call center data. Google Analytics allows you to add a maximum of 12 widgets to a custom dashboard. With Data Studio, you can add as many tables, charts, geo map and filter controls as your heart desires! You can share a Google Data Studio report with anyone by just sending them a share link – just like a Google Doc. You can also share reports with specific people with restricted access, and set View and Edit permissions accordingly. So what are you waiting for? Get started with Data Studio right now at datastudio.google.com. Great tutorials and videos are available on the site and elsewhere on the Internet.